Lu Hao started off life at a healthy 5.7 pounds, but has been growing rapidly and putting on lots of weight since he was three months old. He nows weighs an incredible 132 pounds at the age of three, and continues to grow. His weight is roughly five times more than an average child at his age. At a family meal, Hao tends to eat three full bowls of rice, more than his father and mother combined. Though they recognize that Hao’s weight is a problem, the parents say they must feed him or he will not stop crying. Instead of walking to school, he prefers to catch a ride on his father’s motorcycle. 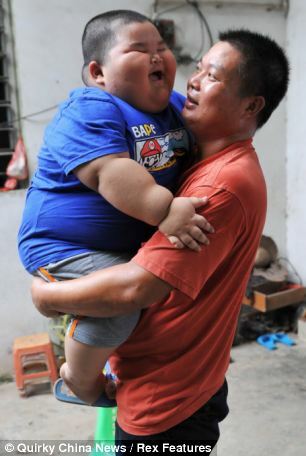 Though his favorite toy is Superman, Hao acknowledges that he will never be like him because “I am too fat.” Both parents have taken him to hospitals, but his hormone levels are supposedly normal. Now, they fear his heart could fail and that he will endure merciless teasing from the children at schools.